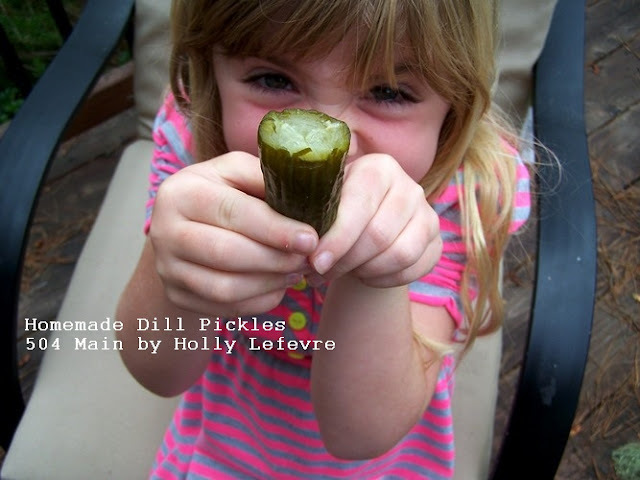 504 Main by Holly Lefevre: Homemade Pickles! I have always loved pickles, in ever way shape and form. and I even created a pickles and cheese sandwich was I was a little girl. And a fabulous dill pickle alone was a huge treat! One of my favorite things to do was buy one of those really ginormous dill pickles right out of the pickle jar at the neighborhood market. 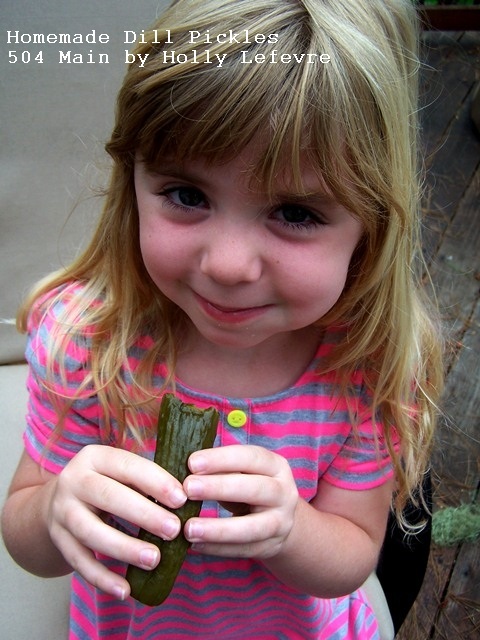 Last year I introduced my little one to the joy of a fresh, homemade dill pickle from a local restaurant. Jules loved them and went pickle and cucumber crazy. That's my girl! I had always wanted to make my own pickles but I thought it would be too time consuming or too difficult for a mediocre final outcome. Well, the other day, while visiting and pinning away, I pinned a recipe for pickles. 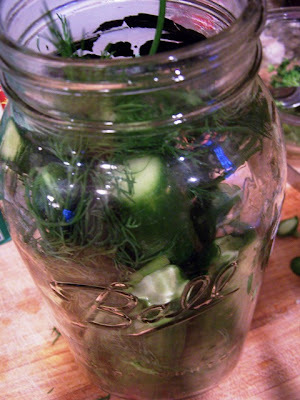 I clicked over to discover this recipe on Common Sense Homesteading for "no canning required dill pickles." Her post is full of other more technical information (about the salt, etc. ), so I highly suggest checking it out if you are interested in trying this. I did a little searching around and found some more information on this method. You can check out those articles on Pillsbury, Pick Your Own, Taste of Home, and Cooks.com. So, after reading a bit, I bit the bullet and did it! I have my big beautiful half gallon Ball jars, I had the pickling salt (Morton's), and garlic. I picked up some small cucumbers and fresh dill at the grocery store. My cucumbers were not organic, but I will deal with that later. So, here is what I did...and seriously, TRUST ME - this was so simple and these are the best pickles EVER! They flew out of my frig and I have another batch brewing...I made need another refrigerator to store my pickles (ha!). FYI: I do specify brand in some of the ingredient because that is what I used. Prepare the jars. I will be honest, I did not sterilize my jar for this batch. I washed it thoroughly with super hot water, but when I make a lot of pickles I will follow the correct canning guidelines. Prepare the cucumber by wash them thoroughly and slicing a small amount off of each end of the cucumber. Wash dill and pat dry. 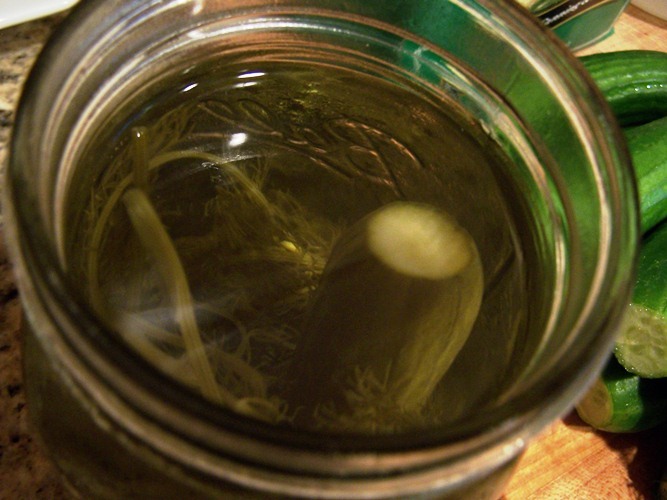 Place about half of your dill stalk and garlic cloves in the bottom of the clean jar. Place prepared cucumbers in the jar. 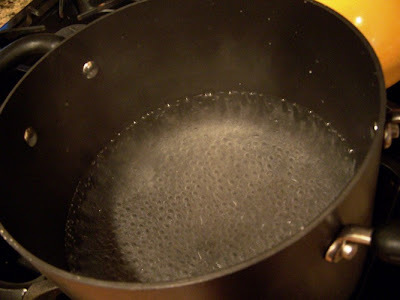 Combine water, vinegar, sugar, and salt in a large stock pot and boil for one minute. 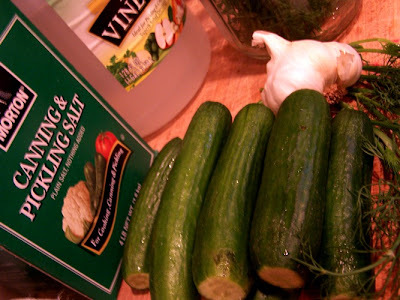 Pour brine into the jar over the cucumbers. 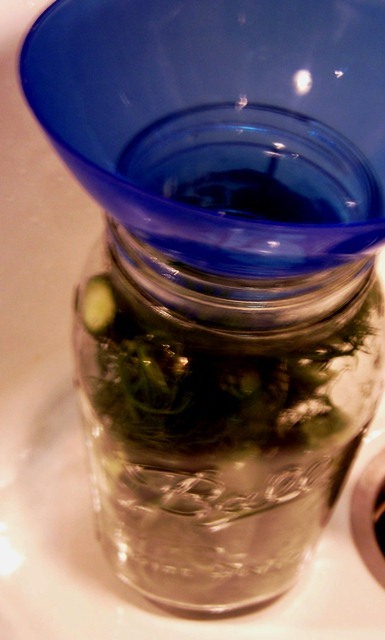 I then added my remaining dill stalks to the top of the jar - it kind of kept the cucumbers down in the jar. 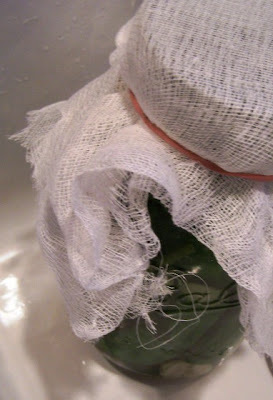 Cut a square of cheesecloth and place it over the top of the jar and secure it with a rubber band. EDIT #2: THANK YOU to Laurie from Common Sense Homesteading for adding this in the comments: "While the pickles sit for a few days at room temp (before they go in the fridge), they need to breath because they will give off some carbon dioxide as they ferment in the brine. That's why you skip the lid until they go in the fridge. The cold temperatures slow down the ferment, so they might "burp" a bit when you open them, but otherwise a lid is preferred once they are in cold storage." I placed mine in the back of my refrigerator for one week before testing them out. The recipes says they should be ready in a few days though. these pickles are the BEST! I will have a hard time ever buying pickles again! What do you think...do you love pickles? If so, you should try this! Oh Holly you made my day, I have a fridge full of cucumbers from my garden, and have been looking for a pickle recipe, I can do this. Making pickles this weekend! Thanks for sharing! I am so going to try these! My middle son and I love pickles. I always thought they were a lot harder to make. Thanks so much for sharing this. That looks awesome. I love pickles but no one else dose in my house. I'm a follower and big fan of your blog. I would like to invite you to be a part of an event I'm hosting on my blog , A Rosie Sweet Home, called Autumn Celebrations. Since fall is a crafters dream when it comes to decorating for the season, I will be dedicating the month of October to all thing Fall, Halloween, and Thanksgiving. 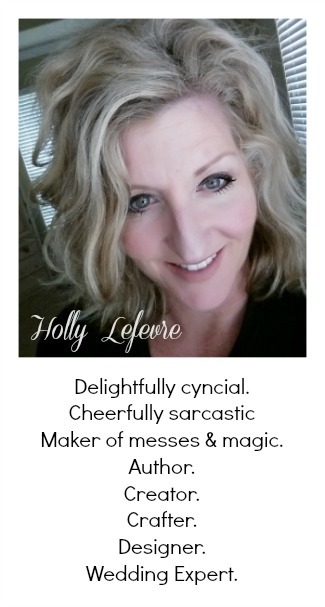 I would be so flattered if you would like to be a guest on my blog, You may share any thing you like that has to do with this wonderful season. If you are interested in participating in this event contact me @ roejoe2@gmal.com for more information or if you have any questions. They look and sound wonderful Holly! Can't wait for a sample *wink*! Those big pickle-jar pickles were always my favorite part of going to a deli for a sandwich when I was growing up. At Canter's in LA, I could sit there all day eating plates of their sour kosher pickles. you've convinced me...especially with that last photo...ADORABLE! I'm going to make these this weekend. This may seem like a silly question, but I'm wondering if before you placed the cheesecloth over the top of the jar you put the lid on. I've never made pickles before and to be honest I've always been intimidated by any sort of canning. You made it seem very doable! This is super easy and a great way to try out preserving food. I did NOT put the lid on before placing my cheesecloth over the lid...I cannot seem to find a reason that you could not just use a lid though! While the pickles sit for a few days at room temp (before they go in the fridge), they need to breath because they will give off some carbon dioxide as they ferment in the brine. That's why you skip the lid until they go in the fridge. The cold temperatures slow down the ferment, so they might "burp" a bit when you open them, but otherwise a lid is preferred once they are in cold storage. Holly - thanks for sharing my recipe and linking back to the site. Holly these look so good! I have made regular canned pickles but they were a pain so I haven't done them since! These look much easier - thanks!! YUMMMO! I am a bit stand offish about making pickles as my parents tried it one year and let's just say the outcome wasn't pretty... or tasty. And there was a whole CROCK of them and parents being Depression babies, food would NOT be thrown out. I LOVE those giant pickles - they are the perfect pick me up and travel food for long drives, btw. Very cool. I like that you did the research, and that a person from one of those sites is helping you in the comments. That is total blog sisterhood. I am going to try some pickles, thanks! I totally LOVE pickles. Even as a little girl we'd go to the deli and the first place I went was the pickle barrel. I have been intimidated to make any but I do really want to try. My husband's dad and uncle always talk about the pickles their mom made so I may try and surprise them! I love pickles and have tried making them a few times now--each time have yet to be successful! I think I need to give your recipe a try! I love pickles and this sounds so easy. I will definitely give it a try. Thanks for sharing at the All Star Block Party! So easy, I just made four jars! I found organice pickling cucumbers at Farmer's Market this week, it was meant to be! Yeah...glad you did it. We are still enjoying ours! 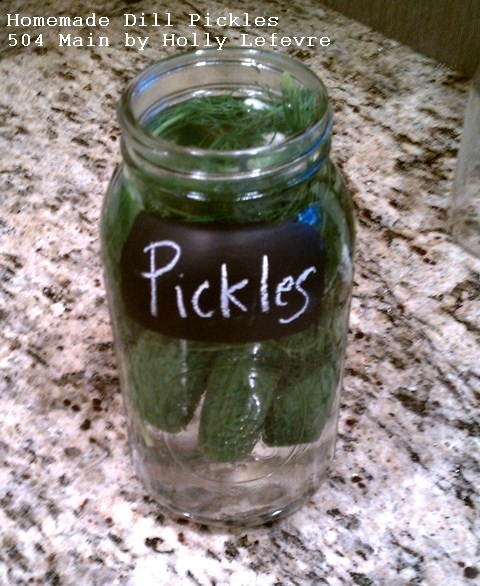 Oh how I loved eating my grandmothers homemade pickles when I was young, thanks for this great idea! Oven Baked Taquitos: Lunch Time, Anytime Good!